Second edition of a fascinating early English guide to mining, which includes an extensive account of the operation of mining and engineering laws and customs, a distinctive sytem which had developed alongside the common law from the middle ages. 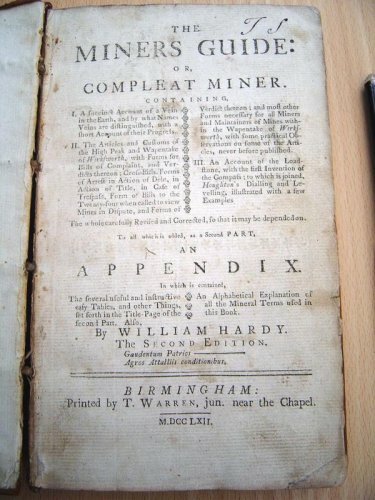 Hardy begins with a brief discussion of methods employed in finding 'veins' of lead-ore, copper-ore, or silver-ore. Then he gives the laws regulating the mining industry, the articles for the High-Peak Hundred, Eyam and Stony-Middleton, Hassop, Ashford in Devon, the lead mines at Wirksworth, Long-Stone near Ashford - each with a list of the jurors, bills of complaint and cross-bills. A jolly mining song is included, concluding 'But Miner read me, take me for they friend, stand to thy custom thus my poems end' (p. 118). 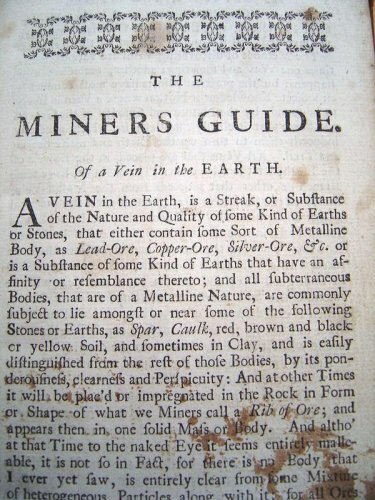 The second half of the work contains a guide to lode-stones and their magnetic properties, magnets and the surveying of mine shafts and mineral deposits, illustrated with numerous tables and some rather crude wood cuts. He also presents a new invention to help for levelling of shafts etc. Some information is given on smelting and assaying processes. The final section deals with the financial side of share holdings and investors. Transcriber's note: spelling or punctuation not understood is marked: [?]. Links have been inserted to ease reading on the Internet. Transcribed at Broadstone, Dorset, England August 2005.
have such Relief therein as shall be found reasonable. of October, in the Year of our Lord, 1665. Vein, one Mear or more according to their taking. Oath he acts under, are many. to be served according to his taking. their Taking. See the 6th Article. the Bar-master and for want of Workmanship. there have been Instances innumerable. any Claim by such his Desertion. ------? always been thought sufficient. -----? keep Possession but three Days. -----? gain Wind, and get out the Water. Spindle, each Week a nick for three Weeks together. Shillings to the Lord of the Field or Farmer. it will be diligently observed. 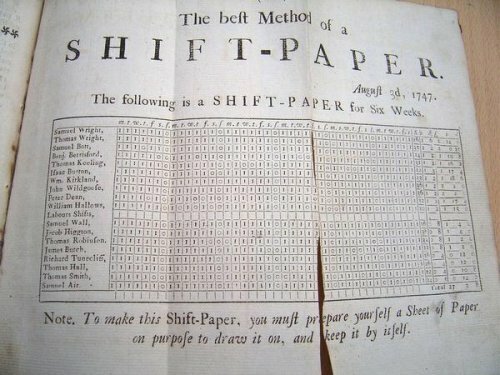 to forfeit Three Shillings and Four-pence. whether the Bar-masters do not buy their own Dishes. to pay any Duties or Part, but Cope only. Highways to their Groves or Mines. to wash their Ore withal. he pleases; even if it was standing Corn. Land, where such Washing is may have no Harm. This Article is pretty much duly observed and kept. takes upon him to fill any one's Mine. any Counterfeit Dish or Measure, in their Houses, Cots? that the customary Duties be paid. the Disturbance of any Man. This is generally observed according to the Letter thereof. unless both Parties be willing to go on Trial. at that Court by Consent of the Parties. carried away to any other Place. unless some just Cause be shewed to the contrary. with the Customs of the Mines, &c.
for one Party shall conclude the Title. shall fully conclude and determine the Title. Benefit nor Plea in Barmote Court. Miner, still it is very little, or none at all regarded. Bar-master or his Deputy only. the Legality of what they do in their Way. though it were at Barmote Court. known one Instance of this being put in Execution. and they shall take the same into serious Consideration. in the least Shape imaginable. which Way and upon what Point the Vein goes. Length, and the Field ought not in any wise to be hindered. shall do him Law truly. this Nature by the 54th Article. Cheeks when he works such a Pee. There are very rarely any Disputes in this Case. Miner as two distinct Veins. his Founder therein to be fixed at the Rither Point. giving his Neighbour lawful warning thereof. Case of poverty given the Offender some Trifle back again. Pity that it should not. meddle therewith, but the Bar-master or his Deputy. half to the Bar-master or his Deputy. does happen, and Complaint made the next Barmote Court. Mines for Thirty Years.' He married Mary Allen of Hope Dale, near Wetton. the Duchess of Cumberland; Philip Gell; and Mrs Gell amongst others. Street, London, when he painted five-year old Lady Georgiana Cavendish. in this book,which is endorsed 'William Bateman' of Middleton-by-Youlegreave. Thanks to Roger Flindall for supplying this note. Correspondence file re Wm Hardy. Dev. Coll., office. one daughter, Mary, who died young. Philip Gell esq, Mrs Gell, Duchess of Cumberland. John Hardy engraved a portrait of: Edmund Burke esq, A Venus de Medici.